While the main story-line heading into Sunday’s 53rd Super Bowl is former Michigan QB Tom Brady appearing in his ninth championship game; there is another man who is one of three writers that’s covered all of these contests. When I was growing up in Detroit, Green and the late Joe Falls were the best one-two punches when it came to credible columnists whom informed readers and provided credible opinions. These guys did things the right way and I’m very proud of the fact that I know and knew both of them! While I’ve had the great privilege of covering four Super Bowls and am very proud of that, I hope Green can reach at least 60. In sports there are many records that will never be broken, Green is doing something more special that unless you’re in Sports Media, you’ll never really appreciate what Jerry has really accomplished. The players make the news, but without great journalists like Green writing the news, nobody would know the news. I’m looking forward to updating this in a year when Jerry reaches No.54. The most interesting part of Sunday’s Pro Bowl was watching Jalen Ramsey catching a touchdown pass in the final minute of the game. I have to wonder whether the Jags might consider using Ramsey as a wide receiver in periodic situations. Speaking of the Pro Bowl, the AFC won it’s third straight All-Star Game 26-7, all at the Citrus Bowl in Orlando, FL. Finally, New England Patriots wide receiver Josh Gordon remains at an inpatient drug treatment facility in Florida after he was suspended in December for multiple violations of his reinstatement under the NFL’s Substance Abuse Policy, a source told NESN’s Doug Kyed. Kyed adds that Gorden’s suspension was triggered by diluted drug test samples. It’s his fifth since 2012 and his third indefinite ban. 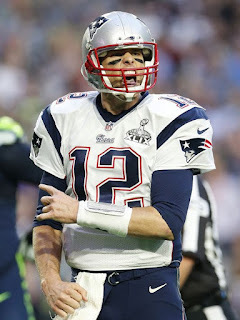 While I’d like to see the Rams win the Super Bowl, I have to agree with recent Sports Exchange Guest Mel Farr Jr.
It’s tough to bet against greatness as in Tom Brady.